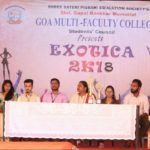 Goa Multi Faculty College incessantly strives to acquaint its students with Corporate Practices by providing them a platform to interact with Industry and Academics Experts. As a part of this initiative, Goa Multi Faculty College, Dharbandora in association with International Centre Goa organized “Academia Industry Interaction” program on 29th September 2015 at ICG, Donapaula. 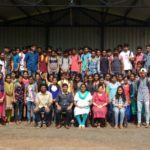 This half day program which lasted from 9.30 am to 1.00 pm marked the presence of distinguished luminaries and 81 BBA Students of Goa Multi Faculty College and 12 of S.S. Dempo College, Miramar. The first Session aimed to provide a common platform for Educationists and Industry Professionals to interact, brainstorm and exchange their views and ideas. Some of the renowned personalities from Goa, namely Shri. Ganesh Gaonkar (MLA), Mr. Bhaskar Nayak (Director of DHE), Dr. Radhika Nayak (Principal, S.S. Dempo College), Mr. R. G. Kamat (Director General, GCCI), Dr. Manoj Kamat , Mr. Yatin Kakodkar (Chairman, ICG), Mr. Nitin Kuncolienkar (Mentor, Smart Link), Dr. Manasvi Kamat (Principal, Goa Multi Faculty College) and Dr. Harip Khanapuri (Vice Principal, S. S. Dempo College) had enriching and fruitful discussion with Dr. Uday Salunke (Director, Welingkar Institute of Management Development & Research). The second session of Academia Industry Interaction started off with a brief overview of the program by Dr. Manoj Kamat. 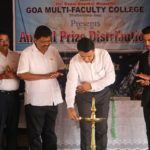 He stated that, this initiative has been taken by Goa Multi Faculty College with a hope that students shall develop new ideas and will get exposure to new trends beyond their normal curriculum. Honb’le MLA of Sanvordem Constituency Shri Ganesh Gaonkar in his Welcome Address acknowledged Dr. Manoj Kamat for this distinct initiative and he urged students to emulate in themselves thoughts that will be shared by Dr. Uday Salunke. As BBA students, do not just look at jobs, try and work on Start up Concepts; remarked Mr. Nitin Kuncolienkar (Mentor, Smart Link). He appealed students to listen to parents, friends but to follow their own conscience while deciding their career. He concluded with a thoughtful message for the students “While you shape up your Career, ensure that you benefit the Country”. The Speaker for the program Dr. Uday Salunke was introduced by Principal of GMFC, Dr. Manasvi Kamat. While addressing the students, he highlighted that we are moving to a new era of imagination; and power of idea is so powerful that we don’t need to restrict ourselves. In his address, he also outlined the challenges faced by Education, Business and emphasized on implications of technological innovations. Future belongs to those with T Shaped Mindset, so develop it; he concluded. Program was well received and appreciated by all the participants. It ended with Vote of Thanks by Dr. Manoj Kamat.